Going Home with Crafty Secrets. There is something about going home. Whether that is now as I head home to my family after a long day or going "home" to where I grew up as a child. If the walls of these houses could talk, there would be a lot of wonderful stories told. From my childhood home, when we brought our first dog, Missy, home, to attending our first prom to our high school graduation. Our childhood home holds many dear memories. I occasionally drive past that old house that my parents sold after we graduated, it still looks very much the same. The fence isn't there, the trees are larger, and time has weathered it but the memories still flood back. I hope that one day my kids remember our home and all the wonderful stories and memories that it holds. 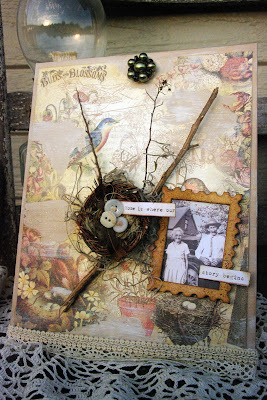 I created this home project from back of the Buds & Blossoms Creative Scraps. The great thing about this image is that it is already looks like a collage. All I did was paint around a canvas and adhered the Creative Scrap piece to it. To add more texture, I painted in areas, letting it dry and spritzed Iridescent Gold Tattered Angels Glimmer Mist to give it a little shine. 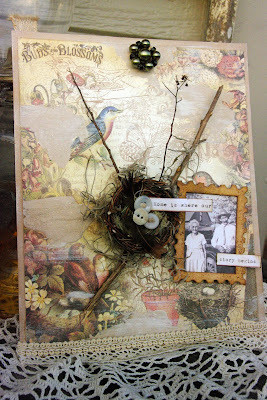 I added a small tree branch, nest, buttons and word strip from the Vintage Photos Creative Scraps. I inked up the Postage Alpha Chipboard from Tattered Angels and spritzed with Coffee Shop and Iridescent Gold Glimmer Mist. 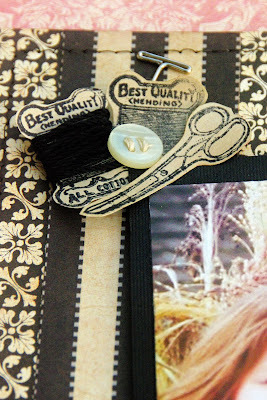 I added the image from the Vintage Photos Creative Scraps and completed the project with some lace and a vintage earring. 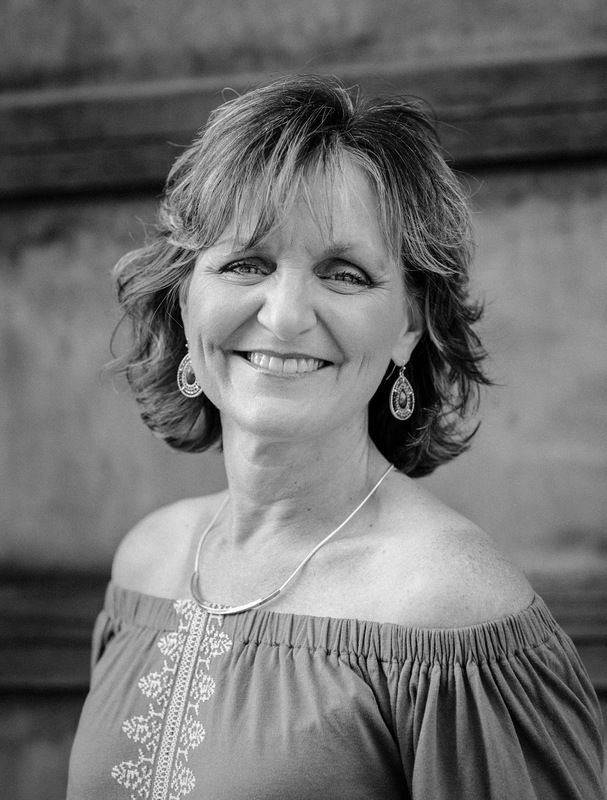 What is your favorite memory of home? I would love to hear! 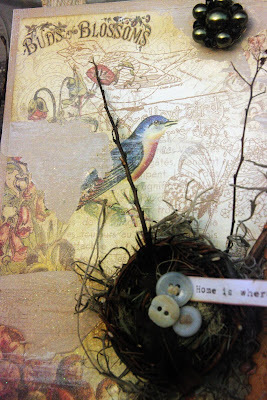 Come back Wednesday, for a "sew" nice scrapbook page using one of my favorite Crafty Secrets Clear Art Stamp Set and Creative Scraps! 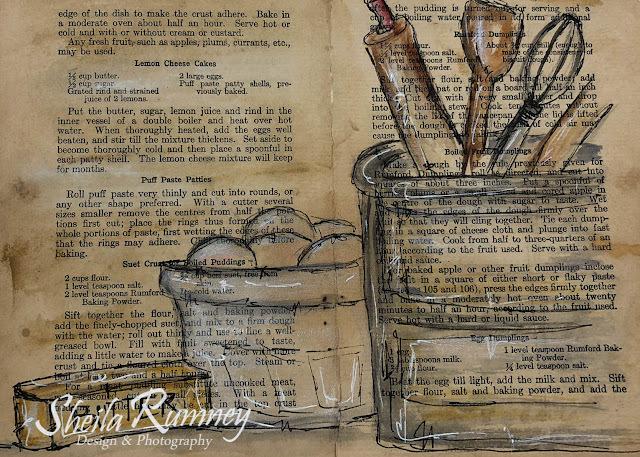 A beautiful project! I have so many wonderful memories of the home I grew up in and I am very fortunate that my parents (both 81 yrs. old) still live in my childhood home. We moved to that house in 1964 so there are 46 years of great memories. 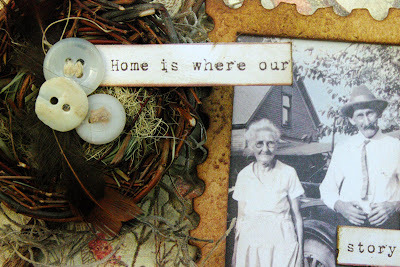 There's no place like home:) Pretty project!